Today I was thinking about the subject of blood pressure and how it could affect you during a long-term emergency. Doing a bit of research on this subject I came across this excellent explanation of what blood pressure readings mean. “Often wonder what the top and the bottom blood pressure numbers mean? Doctors call them systolic (the top number) and diastolic (the bottom number) blood pressure. 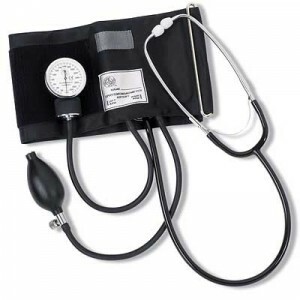 You need a good blood pressure cuff also know as a sphygmomanometer in your first aid kit. Get a good quality manual one and learn how to use it. A while back, I was present when an older over weight person had heart problems at a social activity. Experienced medical people were on the scene, but had no equipment with them. Having a first aid kit with me, I loaned one of them my blood pressure cuff. Much to my surprise it would not fit, their arm was too large. They needed an extra large cuff. Prior to this incident, I did not know they came in sizes. So if you have someone in your family or group that is unusually large you may want to check it out and make sure your cuff will fit. Even if no one in your group has high blood pressure, a blood pressure cuff is an important item for your medical people to have in case of a serious accident or injury. If someone in your family or group has or develops high blood pressure and you have no medication available, there are ways to lower it. Lose weight, exercise, eat a healthy diet, reduce your intake of sodium, limit alcohol, cut back on tobacco products and caffeine, and reduce stress. Here is a list of herbs and spices that have been used in the past for blood pressure problems. Now I am not a Doctor nor do I have any special medical training, the above herbs and alternate treatments have been recommended to me by various sources that I consider reliable. But I do not have high blood pressure, have never tried any of these treatments and cannot vouch for their effectiveness. Most people with high blood pressure have no signs or symptoms, even if blood pressure readings reach dangerously high levels. Get your blood pressure checked and if you have high blood pressure go and see your doctor. This entry was posted in medical and tagged high blood pressure. Bookmark the permalink. I see many healthcare blogs & articles, and read a lot of articles & blogs page, there are huge info in the those blogs & articles. But information was not beneficial & useful. But You have the very nice & beneficial article, who people searching for healthcare information and they in need it. Your blog will help to their peoples, there are many healthcare blogs and article at online, buy few blogs and article helpful & beneficial to increase the knowledge, your blog not only giving the health care information but also blood pressure problems information, So I would like to say thanks to you for this blog.